I tried a pair of Watson’s mid-weight performance base layers on a recent snowshoeing trek in Grand Teton National Park in Jackson, Wyo. The day started out cool and wet, with temps in the low 40s and a heavy drizzle falling from the cloudy skies. Snowshoeing is a great workout, and I chose to wear the silky, stretchy mock neck top and long johns because I was expecting to work up a sweat during my three-hour hike. Right out of the package it’s clear that this product is definitely softer than your average set of long underwear. The fit and comfort were awesome—silky and stretchy on the outside and super soft on the inside. 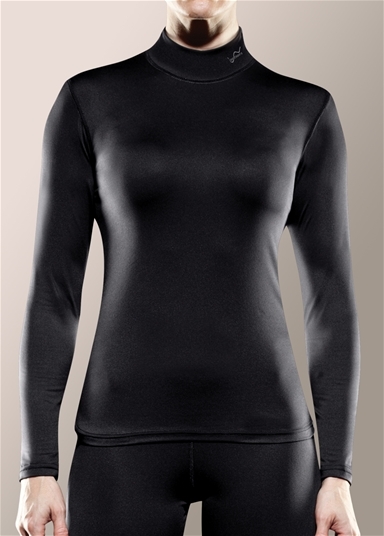 The four-way stretch technology made the top fit snugly but comfortably and felt lightweight and warm. My only gripe about the design was the mock neck, which I generally don’t like in any type of shirt. And although the stretch helped, it was still a little too tight around my neck for my liking. I layered Watson’s micro fleece zip top over the performance base layer top and finally a waterproof outer shell for my snowy hike. I quickly worked up a sweat and felt very warm, but never felt like I needed to stop and remove a layer to stay dry. The performance base layers did their job to let air circulate and wick away sweat before it could soak through to the next layer. As far as the anti-microbial odor technology is concerned, the jury is still out. I used this set of base layers twice on my week-long trip without needing to wash them clean of sweat and stink. When I did wash them, I was pleased to see they came out looking like new, without any piling or dulling of the softness, which I believe is due to the extra care Watson’s took to “brush” the fabric to prevent wear and tear. This hard-working and cozy set of base layers easily gained a permanent spot on my winter sports packing list. I would highly recommend this series for any moderate to strenuous cold-weather activity such as running, skiing, snowshoeing, climbing, etc. Pros: Very comfortable, effective moisture-wicking capability. Cons: Tight mock neckline, limited color options. For more information on Watson’s, visit http://www.mywatsons.ca. This entry was posted in Base Layers, Gear Reviews by Katie Hearsum. Bookmark the permalink.